Beware of the pouring medium mixed with water as it can destroy your painting. I had a painting I had been meaning to varnish for a few months and finally decided to do it 3 days ago. For isolation coat, I figured I would use the pouring medium sold by Liquitex. It levels itself and doesn’t leave brush marks making it perfect for an isolation coat. What could go wrong? Right? Wrong. I mixed the pouring medium with quite a bit of water to get it to flow easily (which was a mistake). It did flow very easily and had the same consistency as water. However, the medium was taking too long to dry so after waiting 2-3 minutes, I started to brush off the excess medium (which was another mistake). After the painting dried, I noticed that sections of it had gone white. The medium dissolved the acrylic paint and probably took the paint with it while I was trying to get excess medium off the canvas. Needless to say, I redid parts of the painting that had gone white and varnished it again. This time I was very careful and the painting came out looking better than it did before. Another thing I noticed while painting on top of pouring medium layer is that my paint stayed wet for longer than usual. Not as long as as oil paints do, but long enough that I could blend very easily. I am going to experiment with this new knowledge and see what it goes. – Don’t mix too much water into the pouring medium when using it as an isolation coat for varnish. – Don’t be impatient after you have varnished or put on an isolation coat. Give it as much time as it needs to dry off. The painting probably would have been ok if I had not tried to brush off excess medium after waiting a few minutes. – Acrylic mediums can liquify acrylic paint even after it has dried completely. 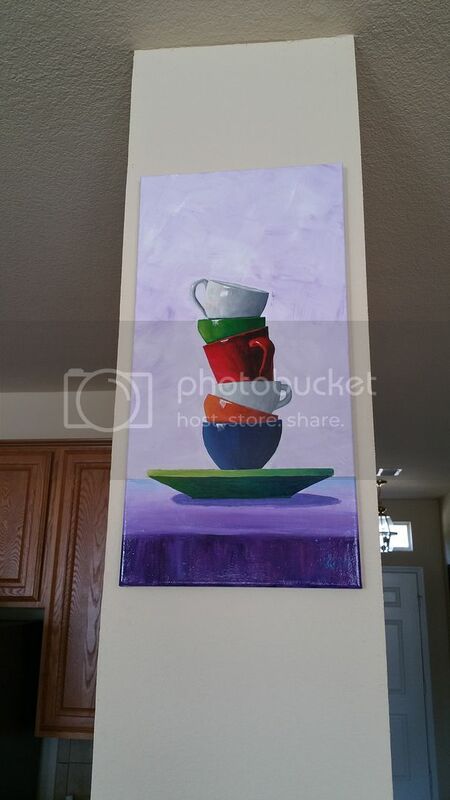 – High gloss finish looks very good on some paintings. Here is the painting that almost got destroyed by the pouring medium on the wall of the person who asked me to paint it. Oil vs Acrylic – What’s easier to clean? I’ve started making paintings with Liquitex pouring medium and somehow all the gloss is gone when dried. Do I varnish my pouring medium paintings? You are probably using a matte or satin medium. These medium contain matting agents that reduce the shine of the paint surface. Try using a glossy pouring medium. Acrylics are a water based medium and it’s very easy for them to get damaged by water so I would highly recommend varnishing your paintings. You can either varnish the painting directly or put pouring medium or a layer of another medium on top of the painting and varnish after that. Putting a layer of medium on top of the painting makes it easier to remove the varnish and re-apply it later. Also when using pouring medium as a top coat or varnish beware of too much brushing. It will gum up, so to speak and get all lumpy from too much moving about. I learned this the hard way. I do use pouring medium as a varnish and it does give a really good shine to the finished product. I’m wary of ever learning anything against it though or having it packed up with any other paintings as I have a feeling it will leave impressions or marks.